Three is a brand name under which several UMTS-based mobile phone networks and Broadband Internet Providers are operated in Australia, Austria, Denmark, Hong Kong, Macau, Indonesia, Ireland, Italy, Sweden, and the United Kingdom. The company was founded in 2002. CK Hutchison Holdings (formerly Hutchison Whampoa) owns direct majority interests in the companies that operate the networks that are branded 3, except 3 Hong Kong and 3 Indonesia. These networks are majority-owned by Hutchison Asia Telecommunications, a wholly owned subsidiary of CK Hutchison. Its operations in Europe are run by a separate division, 3 Group Europe. All 3-branded networks provide 4G (LTE) and 3G technology (WCDMA, some also run 2G networks). Hutchison Whampoa no longer holds a 3G licence in Israel which was operated under the brand Orange, and in Norway which is not operational yet. As of 30 June 2015, registered 3 customers worldwide numbered over 30.1 million. Like other mobile-provider Internet homepages, 3's portal is 'free to browse' for some content in most 3 countries including Ireland, UK and Australia in most price plans; the user pays a fixed price for each video, text or application downloaded. Besides that, 3 UK and also 3 Ireland initially made the decision to block direct Internet access from handsets, while 3 Austria allowed access to the Internet since the beginning. In 2004, 3 released a PC Card 3G Data Card ("NetConnect Card") for Windows-based laptops which allows Internet access through 3's network directly from the computer, accompanied by a range of data and business tariffs. Later, more cards and USB modems for HSDPA were introduced. In November 2007, 3 started to sell the Skypephone, which was developed in conjunction with the Chinese phone manufacturer Amoi and Skype, combining the functionality of a UMTS handset with free voice calls and instant messages from Skype. The phones were sold exclusively by 3 on contract and on a prepaid basis. 3 also produced an application called "Skype on 3" which brought the same functionality to S60 and J2ME-capable phones (but not iPhone or Android, although some unofficial Android versions were distributed). Unlike the non-3 versions of mobile Skype, "Skype on 3" does not use the phone's data connection for voice calls, but instead places a normal phone call to a special number which 3 make available for this service. 3 does not charge users for calls to this number. This service is available in Australia, Ireland and the UK; it has been discontinued in Austria, Denmark, Hong Kong, Italy and Sweden. A company called iSkoot (now Qualcomm iSkoot Inc.) was behind at least some of the clients and back-end servers but iSkoot announced a shutdown scheduled for 20 January 2011. It appears this shutdown initially affected the J2ME version and some Skypephones (which now show a "click to upgrade" link which either doesn't function or takes you to a page saying an upgrade is not available), but some S60 versions were not affected. Skype have started sending emails indicating the Skype on 3 service will be terminated on 30 September 2014, in spite of Three's original "free for life" advertising. The recommended clients for smartphones will use the phone's data connection which may be liable to charges, instead of the dedicated access number used by the client, which was free to call. In February 2007 3 introduced '3 Like Home': a service that in theory allows subscribers to use any 3-branded network with the exception of 3 Indonesia without having to pay additional roaming charges, instead paying the same amount for voice, data, and messaging services as they would do on their home network. This also allows users to use their free or inclusive bundles and allowances while abroad. However, pre-pay customers do not benefit fully, as they can not yet use each 3 branded network for '3 Like Home'. 3 Australia confirm that calls made using '3 Like Home' are not included in any "cap" plan or inclusive bundles. This arrangement is possible because of the roaming agreements between the networks. Each of the networks provides service to other partners networks free of internal roaming charges. This means that the marginal cost of a roaming call is much the same as a call on the home network. At the end of April 2009, 3 UK announced that '3 Like Home' would no longer be available to customers of the 3 UK network from 30 June 2009. On 7 April 2010, 3 Sweden announced that '3 Like Home' would be discontinued on 23 May 2010. No cancellation announcements have yet been made for customers of other 3 networks. On 19 August 2013, 3 Austria announced at a press conference that '3 Like Home' would no longer be available for new customers, following their acquisition of Orange Austria. Existing plans are unaffected. On 30 August 2013, 3 UK launched "Feel At Home" for UK customers visiting Australia, Italy, Denmark, Austria, Sweden, Hong Kong and Ireland, where calls, texts and data are charged at their standard UK rate. On 4 December 2013, 3 UK added Indonesia, Macau, Sri Lanka and the USA to the list of countries included in its "Feel At Home" package. On 1 July 2014, 3 UK added France, Finland, Israel, Norway and Switzerland to the list of countries included in its "Feel At Home" package. On 22 September 2014, 3 UK added France, Norway and Switzerland to its '3LikeHome' list. On 1 April 2015, 3 UK added New Zealand and Spain to the list of countries included in its "Feel At Home" package. In Sept 2014, 3 Denmark added France, Germany, Norway and Switzerland to it's "Roam Like Home" proposition. In May 2015, 3 Denmark added Portugal, Malta, Greece, Cyprus and Spain it's "Roam Like Home" proposition. In November 2015, 3 Denmark added USA and Singapore to it's "Roam Like Home" proposition. On 8th September 2016, 3 UK added an additional 24 European destinations, including Germany, Portugal and Greece from September its "Feel At Home" package. Hutchison launched the Three network in Australia in 2003, via its majority ownership of Hutchison Telecom Australia Ltd (HTAL). It operated a 2,100 MHz 3G network in a 50/50 partnership with Telstra (the radio networks were shared while the core networks were separate), covering approximately 56% of Australia's population. The 3G network covered Sydney, Melbourne, Brisbane, Adelaide, Perth, the Gold Coast, Canberra, Geelong, Frankston and Wollongong. On 9 February 2009, HTAL and Vodafone announced that they would be merging their Australian operations into a 50-50 joint venture called VHA Pty Ltd. All products and services offered by VHA would be marketed under the Vodafone brand. The merger was approved by shareholders and regulators on 29 May 2009, and Vodafone Hutchison Australia Pty Ltd was established in June 2009. The Three and Vodafone networks remained separate until August 2009. Vodafone phased out the Three brand from late 2011 onwards. No new registrations to the Three brand were made after this time. Hutchison formerly operated an Australian CDMA network under the Orange brand name, as Orange One. It allowed customers to use their 3 Branded CDMA mobile phone as a Home phone when at home. Calls made from their mobile were charged at rates similar to those of a Landline. Customers also received a "Local Zone " number allowing them to be called on a Landline number whilst at home. Should the phone be out of the Local zone, Calls made to the landline number either diverted to the Mobile number at a small fee, or was directed to Voicemail on the mobile handset. These plans started at a very competitive price of $10.00 per month, and local calls from the local Zone to a local landline was charged at 20c per local call, making their service cheaper than those of Telstra or Optus. The Orange One network was not as vast as others, and so Orange made arrangements with Telstra to allow the services of Orange one devices to roam to the Telstra network On 1 February 2006, it was rebranded as 3 CDMA, and this network was closed as of 9 August 2006. 3 CDMA customers were offered special tariffs and incentives to continue as customers on the 3G network, all customers either moved over to 3's 3G network or to other network providers. 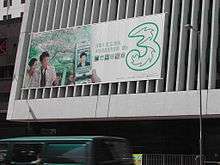 An advertisement for 3 in which Leon Lai, a Hong Kong-based Cantopop singer, is the pinup. In May 2004, its affiliated 2G operator Orange re-branded its services and changed its name to "3 Dualband", referring to the GSM product, and "3 CDMA", referring to the CDMA product. On 29 May 2008, Hutchison Telecommunications (Hong Kong) Limited announced that it has signed an agreement with Apple Inc. to bring the iPhone to Hong Kong and Macau later that year under 3. In 2012, a partnership with Vodafone was launched and 3 Hong Kong is a member of the Conexus Mobile Alliance. 3HK has also partnered with a leading fintech player, WeLab, providing interest-free installment plans for purchasing of mobile devices. The 3 service was launched commercially in Indonesia on 30 March 2007, with the company name is Hutchison Charoen Pokphand Telecommunications (HCPT). Only after 9 months of operations, 3 acquired about 2.2 million GSM customers. 3 achieved high customer mindshare maintaining at about 90% of awareness level as of April 2009. As of April 2009, 3 Indonesia had about 4.5 million customers on its GSM network. 3 offers both pre-paid and post-paid (contract) services. Currently, the post-paid service is available in Jakarta, Bandung, and Surabaya area. 3 Indonesia slogan is "Jaringan GSM-mu (Your GSM Network)", formerly "Jaringan Selularmu (Your Cellular Network)". Sometimes, 3 use "Mau? (Want it?)" and "Hanya di 3 (Only on 3)" slogan in their ads. 3 currently has full GSM coverage in Java, Sumatera, Bali, Lombok, and Riau Islands. And as of April 2009, Kalimantan is covered in South Kalimantan and Sulawesi is covered in South Sulawesi. The 3 UMTS/HSDPA service is now available in most parts of Java, especially big cities like Jakarta, Surabaya, Bandung. 3 Indonesia launched its new unlimited text and MMS service for a fee with Facebook on 8 April 2009, so registered 3 customers can update status, write on wall, or upload new pictures freely without any more charges. Beside with Facebook, 3 also cooperated with Yahoo! to give unlimited chat for a fee by SMS and downloadable app using Yahoo! Messenger service. Both of these are the first of their kind in Indonesia. It is announced that Charoen Pokphand divested its telecommunication business in Indonesia by sale of its share on 3 to Garibaldi Thohir and Northstar Group. The company name is now PT. Hutchison 3 Indonesia. Three Austria started operations in May 2003. The company promised to have 95% population coverage with HSDPA end of 2007. By 2008, 3's 3G coverage reached 94% of the population. Outside the coverage of its own 3G-network (UMTS/HSDPA/HSPA+) it relies on national roaming on the network of T-Mobile Austria (before Mid-2012, the network of A1 was used for national roaming). 3 Austria is the first in Austria to offer its customers so called "HD Mobile TV" based on the H.264 encoding standard, and won IIR telcon awards for their eBay (2006) and X-Series Gold (2007) offerings. 3 Austria won a DVB-H license and launched the service in June 2008, with three devices and free usage of Mobile TV. In September 2010 - The number of 1 million customers were exceeded. In November 2011 - 3 Austria launched HD Voice  and LTE  On January 2012, 3 Austria announced its national roaming agreement with T-Mobile, which will introduce from July 2012. Customers of 3 Austria will be able to roam on T-Mobile's GSM-network where 3's UMTS-network is not available. Simultaneous clients of T-Mobile (including tele.ring) will be able to roam on 3's UMTS-network where T-Mobile's UMTS network is not available. The roaming agreement with A1 will be continued parallel until year-end. On 3 February 2012 Hutchison Whampoa announced that it had bought Orange Austria for US$1.7 billion, from France Télécom which owned a 35% stake, and private equity firm Mid Europa Partners, which held the remaining 65%. The combined business will create a mobile carrier with 2.8 million customers and more than 20 percent market share in Austria. JPMorgan Chase advised Hutchison on the deal, while Morgan Stanley advised France Télécom and Mid Europa Partners. 3 Denmark and 3 Sweden have a common network covering most of the two countries. Customers are "at home" on both networks, i.e. Danish customer receive calls from Denmark without paying roaming fees when they are on 3 Sweden's network and it does not cost extra to call Danish telephone numbers. 3 Scandinavia also has a license to build a network in Norway (in 2011 3 declared that they are not going to launch a 3G network in Norway), but currently 3 Denmark and 3 Sweden have to have positive financials. In 2008 both operations showed a positive EBITDA. In Sweden the mobile network is shared with Telenor, except for cities like Stockholm, Gothenburg, Malmo, Lund and Karlskrona where they handle their own 3G networks, but this practise is not allowed in Denmark. In the spring 2011 3 started, without Telenor, to build their own 3G Network on the UMTS 900-band which will give a bigger coverage. UMTS 900 and LTE 800 is rolled out using the same base stations. Today 3 Sweden covers about 98.5% of the Swedish population. In May 2012, 3 Sweden launched it first LTE services. It uses the TDD2600, FDD2600 and FDD800 bands. According to ZTE, this is the world's first multi-technics LTE network. Each day about two new sites are started. In the beginning of 2014, 3 Sweden was Sweden's fastest growing mobile operator. Hutchison 3G launched in the UK on 3 March 2003 (03-03-03), the day that 3G services went live across the country, and handsets went on sale later that month. This made Three the UK’s first commercial video mobile network. On 9 December 2004, Three announced that they were the first network to meet their regulatory requirement of 80% population coverage in the UK. Three's UK division is owned entirely by Hutchison Whampoa. Three operates 3G and 4G services, and maintains a national roaming agreement with Orange to provide 2G services where 3G is unavailable. Until 2006, Three partnered with O2 for 2G services. The 2G fallback coverage provided by Orange has since greatly diminished, while still available, it is being removed in some areas as Three believe 3G technology is now enough for mass adoption, and as a result, many (often at the cheaper end) phones that support only 2G networks are not compatible with the Three network. As of 2013, Three no longer provides a significant 2G fallback for most of the United Kingdom. Three's first retail stores (3Store) opened at the same time as the network launched, on Oxford Street and High Street Kensington, both in London, and at the Birmingham Mailbox. Three's handsets and contracts are also sold by mobile telephony chains and independents throughout the UK, as well as online retailers. In 2005, an expansion of the 3Store portfolio saw stores opened in larger malls throughout the UK, such as the Bluewater Shopping Centre, and The Mall at Cribbs Causeway near Bristol. On 24 October 2006, Three announced that it had purchased 95 high street shops from O2 and The Link. ↑ Hutchison Whampoa Limited: Telecommunications Archived 20 November 2007 at the Wayback Machine. ↑ "Hutchinson Whampoa Annual Report 2012" (PDF). Retrieved 1 April 2014. ↑ "Three UK "Skype" APK". Retrieved 6 December 2011. ↑ "Help for Skype: Can I use Skype on 3 abroad or over WiFi?". Archived from the original on 18 January 2012. Retrieved 2 October 2011. ↑ "Help for Skype: Will it cost me anything to use Skype on 3?". Archived from the original on 20 January 2012. Retrieved 2 October 2011. ↑ "Help for Skype: I heard that Skype had been discontinued on the 3 network, is this true?". Archived from the original on 4 January 2012. Retrieved 2 October 2011. ↑ "Three's Skype system revealed, and how to use unsupported phones". Retrieved 6 December 2011. ↑ "iSkoot for Skype (on Internet Archive)". Archived from the original on 2011-04-22. Retrieved 6 December 2011. ↑ "Help for Skype: How can I get Skype for my 3 phone?". Archived from the original on 19 January 2012. Retrieved 2 October 2011. ↑ Stepanek, Martin. "Orange ist Geschichte: 3 streicht Gratis-Roaming" (in German). Future Zone. Retrieved 19 August 2013. ↑ "Feel At Home.". Three UK. 2014-10-15. Retrieved 2014-10-15. ↑ "Feel At Home now includes the USA!". Hutchison 3. 2013-12-04. Retrieved 2013-12-04. ↑ "Bonjour to using your phone abroad at no extra cost in 5 new destinations". Hutchison 3. 2014-06-05. Retrieved 2014-06-05. ↑ "Hi3G expands 3LikeHome initiative to four EU countries". TeleGeography. 2014-09-23. Retrieved 2014-09-23. ↑ ok2phone-com (4 August 2004). "Telstra, Hutchison share 3G network". ZDNet. Retrieved 18 November 2012. ↑ Sainsbury, Michael (10 February 2009). "Vodafone Australia and Hutchison '3' mobile merger". The Australian. Retrieved 24 January 2015. ↑ "ACCC not to oppose proposed merger of Vodafone and Hutchison". Australian Competition and Consumers Commission. Retrieved 21 August 2009. ↑ "About 3". Retrieved 20 June 2009. 1 2 "Vodafone Ends New 3 Mobile Customer Registrations". Gizmodo.com.au. 31 August 2011. Retrieved 18 November 2012. ↑ "3 is now closed in Australia". Vodafone Hutchison Australia. Retrieved 24 January 2015. ↑ 3 to bring iPhone to Hong Kong and Macau Archived 30 May 2008 at the Wayback Machine. ↑ "Archived copy". Archived from the original on 20 August 2008. Retrieved 6 August 2009. ↑ 3 Indonesia coverage map Archived 4 March 2009 at the Wayback Machine. ↑ "Thohir dan Northstar Beli Saham Tri". The Wall Street Journal. Retrieved 2016-06-13. ↑ "Unternehmen — Presse — Presseaussendungen — Detail". www.drei.at. 2011-11-16. Retrieved 2012-11-18. ↑ "Unternehmen — Presse — Presseaussendungen — Detail". www.drei.at. Retrieved 2012-11-18. ↑ "Neue Mobilfunk-Kooperation in Österreich | heise mobil". Heise.de. 2012-05-21. Retrieved 2012-11-18. ↑ "Vodafone Ireland and Three Ireland announce strategic partnership to share network infrastructure". 13 July 2012. ↑ "Twitter / 3online: @Kei_Jo That's normal as we're". Twitter.com. Retrieved 2012-11-18. ↑ "Archived copy" (PDF). Archived from the original (PDF) on 14 July 2014. Retrieved 24 June 2013. ↑ "Three Ireland to launch comprehensive 4G offers". Hutchison 3. 2014-01-27. Retrieved 2014-02-04. ↑ "3G goes live in the UK". BBC News. 2003-03-03. Retrieved 2012-02-25. ↑ "3 first to hit regulatory requirement for 3G coverage" (Press release). 9 December 2004. Retrieved 25 February 2012. ↑ "3 selects Orange as new national roaming partner" (Press release). 10 May 2006. Archived from the original on 17 March 2012. Retrieved 25 February 2012. ↑ "3 starts killing off 2G coverage". 8 November 2010. Retrieved 25 February 2012. ↑ "3 brings next generation of mobile stores to life" (Press release). 18 November 2005. Archived from the original on 11 August 2014. Retrieved 25 February 2005. ↑ "3 acquires 95 prime-location stores from the Link and O2" (Press release). 24 October 2006. Retrieved 25 February 2011.